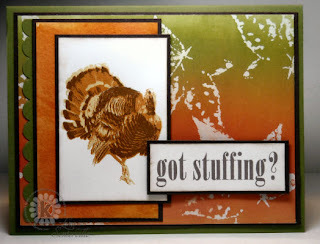 Designs by Lisa Somerville: TechnoStamper Sketch Challenge - Got Stuffing? TechnoStamper Sketch Challenge - Got Stuffing? Hope you all had a wonderful Halloween! We started getting trick-or-treaters around 3:30, with the last of them at 7:30pm. The constant ringing of the doorbell drove the dog nuts, the kids were all bundled up as it was cold here, but what costumes I did see were cute. Trying to stay one step ahead this week, as I've got a few things going on, today's card is for MJ's TechnoStamper Sketch Challenge - using this sketch. Here's my take....I used the Versamark Resist Technique and Pumpkin Patch ink to create my background panel using the Multi Step Big Leaves from Kitchen Sink Stamps. The Orange panel under my image was created with the Cling and Scrunch Technique using a combination of Color Wash Sprays and Glimmer Mist. My focal image is from the 3 Step Turkey Trot, stamped as follows: #2 Pumpkin Pie, #1 So Saffron, #3 Memento Rich Cocoa. The sentiment is from this same set, stamped in Memento Rich Cocoa on White, then sponged with Stampin' Up! Soft Suede. Don't forget tomorrow is Challenge Day at Kitchen Sink Stamps, I'm your hostess for this months Challenge, we're also cooking up some great Holiday cards using the new Holiday Releases, and I'll have a special ONE DAY ONLY KSS promotion to share with you. See you then! Luvin' this card! Background and colors are all perfect. Poor Tom, "run Turkey, run! I should've sent my bags of candy to your house! We only had 2 trick or treaters all night!! This is a great card and I love the b/ground you created! I must check out this sketch - it's so versatile. Love this card, the background is great and your turkey looks so innocent. Beautiful colors. Tee Hee, this is so cute. Love the colors. Thanks so much for playing along. Great card, hard to believe Thanksgiving is right around the corner.